Is neck pain your constant reality? Is its cause purely physical? Or could you be suffering from neck pain for other spiritual or metaphysical reasons? Everyone suffers pain and stiffness in their neck at some point in their life. Whenever we feel stress, our upper backs, shoulders and neck seem to carry the brunt of it. Additionally when we feel stressed, we tend to breath rapidly and shallowly and our hearts beat faster. We clench our fists and stiffen our muscles, bracing ourselves for the assault. We lift up and tense our shoulders and trapezius muscles, which in turn tenses the neck muscles. This stress response makes us ready for the fight or flight, an evolutionary response that was necessary for our survival. Unfortunately, this physical response no longer serves us very well for most of our modern situations, as no real physical danger is present. However, our perception of the mental stress elicits the exact same exact physical response in our bodies, even if there is no need to actually run or stand and fight. Chronic tension in our muscles, from repeated stress responses, leads to upper back, trapezius and neck pain. The pattern of repeated tension in these muscles leads to long-term issues. If we learn instead to become aware of the emotions involved in the stress response and learn to feel them so we can release them we can prevent this cycle of stress and muscular tension. Yes! Tension is indeed an emotional response. The emotions involved can be anger, jealousy, sadness, and disappointment (and many more). If these emotions continue to be suppressed, anxiety and fear builds creating yet more muscular tension. A viscous cycle ensues. Emotions do affect your body, whether or not you chose to realize it and/or accept it. 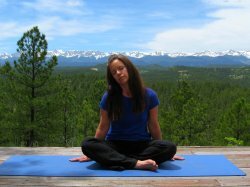 Mindful activities such as meditative yoga stretching, meditative foam rolling and stillness through meditation will help you meet your body in openness to receive the information it needs to heal! Regular opening of the neck through exercises such as I give you below, will bring awareness to your neck and shoulders and the tension they carry. Neck pain from a simple cause like transitional stress, can be quickly alleviated by performing these simple neck stretches for the neck muscles. Chronic neck pain and conditions of the neck are the result of a 5th chakra energy blockage. Keep reading to understand why neck pain may be chronic in your life. Everyone gets neck pain, but there is a reason why it doesn't go away. It is up to you, in stillness and meditative moments to discover why! It is important to understand the metaphysical cause of your neck pain, if you sense that it is from more than just occasional and/or transient stress. Most likely, this is the reason that you found this article! It is because you already know that there is a deeper meaning. The only way to relieve the spiritual and emotional aspects of ongoing and unrelieved neck pain is through spending time with your neck. As I stated above, if your stress and neck pain have become chronic, you have a 5th chakra energy blockage. Please click on this link to see how a deeper meditation that I offer can bring you healing and relief. The neck stretches below will also help you become aware of your neck posture. Holding tension in the neck is so automatic for everyone, that understanding what is neutral is vital for healing! Practice this posture, sitting on the floor, to help you learn where your neutral neck posture is. Learning what it feels like to neither flex, extend nor rotate your muscles is very important in relieving stress. Start your neck stretches, preferably sitting in the half-lotus position, or the Easy Pose ("Indian-style"). If this pose is uncomfortable for you, just sit upright in a chair. Take a minute to center your self and focus on your breathing. Begin to breathe slower and deeper. Feel your body relaxing as you inhale slowly, and then exhale. Center your head and neck and attempt to find the neutral neck posture where it is straight, relaxed and where no neck muscles are working. Avoid the tendency to lift your chin. To overcome this tendency, ever-so-slightly tuck you chin down. Spend 20-30 seconds in this neutral neck posture as you breath deeply. You may wish to do this in front of a mirror to check that your head, neck and spine are straight. It is equally effective to do this pose sitting up against a wall, so that your hips, shoulders and the back of your head touch. This is neutral for your spine and neck. 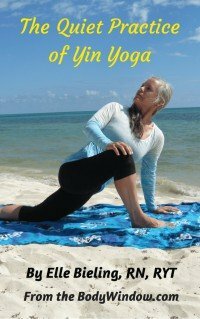 I call these neck stretches body meditations, or meditating with the body, because it is so much more that just rushing through the exercises and pushing through the stretches! It is the intention of the practice that truly makes the difference. It is the intention to go inward, relaxing and releasing that is so very therapeutic. You can only do this releasing with deep and conscious breathing. Closing your eyes during the mindful movements also helps with your journey inward. Be willing to meet your neck, throughout your body meditations that I show below. Are you ready to begin? Come to the Easy pose or crossed-leg position once again. Slowly and mindfully turn your head to the left, then slowly towards the right. Hold each side for a minimum of 20-30 seconds. Continue to deeply breathe. Feel the stretch in your neck (sternocleidomastoid muscle) as you hold this neck stretch. Invite your neck to release and let go! Notice how the longer you hold the stretch, with mindful and deep breathing, that you neck may release a bit more, as you invite the opening! You may hold the stretch as long as you heart desires. Maybe even have a conversation with your neck, telling her that it is OK now to release and let go. Ask you neck why she is bothering you so much? Ask you neck what is the primary emotion that she is holding and unable to release? Invite her to release it now! Now slowly and mindfully tilt your head back as far as it goes. Feel the neck stretch in the front. Hold for 20-30 seconds. Now tilt your head down and touch your chin on your chest. Really feel the pull of the neck stretch on the back of your neck. Invite your neck to release. Finally touch your left ear to your left shoulder. Hold for 20-30 seconds. Do the same for the right side. Keep breathing deeply. If you find your neck needs even more releasing, I would advise my 5th chakra healing meditation to deepen your awareness of your energy blockage. Click on the link for more information on this important concept. 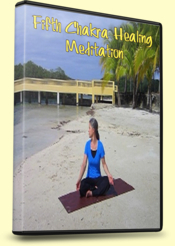 Are you ready to purchase the 5th Chakra Healing Meditation to go even deeper now? Keep scrolling! Please be advised that this is a digital product, for immediate download only! You will NOT receive a DVD nor hard copy of the video in any form. I use PayPal, but you do not have to have a PayPal account to purchase my video. You may use a credit card instead. Look for the instructions when you click on the By Now button. For those outside the USA, PayPal converts to your currency automatically. To see what it will cost you in your currency, click here. You will also need to ensure that you have a PDF reader installed on your mobile device, like Adobe Acrobat or similar. If you do not have a PDF reader, please click here. If your Apple mobile device has iBook or Notes installed this may also serve as your PDF reader.